Disclosure / Disclaimer: I received this book, free of charge, from Kensington Books, via Netgalley, review purposes on this blog. No other compensation, monetary or in kind, has been received or implied for this post. Nor was I told how to post about it. leading up to St. Patrick's Day! With conflicting theories on the crime—not to mention the possibility of a proposal—tensions are running high between Siobhán and Macdara. Soon it’s up to Siobhán to call a killer’s bluff, but if she doesn’t play her cards right, she may be the next one taken out of the game . What a FUN mystery! Not only do you have a neat 'locked room' mystery, that Agatha would have approved of, you have a little chick lit romance! This is a fun, quick read (I read it in 2 days), and perfect for ushering in Spring (yes, I KNOW some of you are still landlocked in snow, but the rest of us are in balmy Spring already! ), and St Patrick's Day! You may find yourself sidetracked with all the food mentioned, so be warned to not read hungry! 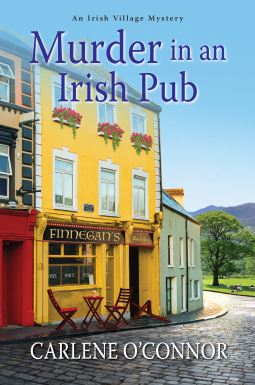 This is the 4th book in the An Irish Village Mystery series, and I can't wait to go back and read the previous three, to see how Siobhán went from running the family bistro to be a Garda! This is the 'Americanized' version, without yeast, that requires no rising, just a few kneads. This bread is perfect for breakfast with warm butter and jam. 1. Mix the whole wheat flour thoroughly with the white flour (or white flour/oats). 2. Add butter, then baking soda and salt. 3. Make a well in the center of your mixture, and gradually mix in the buttermilk. Stir with a wooden spoon. Note: You may need less or more liquid, depends on which flour/mix you are using, and its absorbency- your dough should be manageable. 4. Butter a non-stick loaf pan and place bottom parchment paper on bottom, preheat oven to 425 degrees. 5. Knead the dough into a ball, in your mixing bowl, about 10 times, then turn out into your pan. 6. Bake for 25 minutes, reduce the heat to 350 degrees and remove your loaf from the pan and put it back in the oven (sans pan), and bake a further 10-15 minutes. This gives it a crustier taste all the way around. It should sound hollow on the bottom, when done. Carlene O’Connor comes from a long line of Irish storytellers. Her great-grandmother emigrated from Ireland filled with tales and the stories have been flowing ever since. Of all the places across the pond she’s wandered, she fell most in love with a walled town in County Limerick and was inspired to create the town of Kilbane, County Cork. Carlene currently divides her time between New York and the Emerald Isle. She is currently at work on the next book in the Irish Village Mystery series.